The Isolaz is here and we had a round of demonnstration as well as training today for our drs as well as nurses. It was fun to try it out on Dr Angeline who has been having quite regular breakouts since she started her Masters course in Aesthetic Medicine and Ima our pharmacist who has been suffeing from pustular and cystic acne for many years. I've written about Isolaz before (under Photopneumatic Therapy) but today I see it's potentail use even better. Now we can treat active, inflammed, red, painful and cystic acne fast and without systemic intake of Isotretinoin and oral antibiotics. So what is Isolaz ? 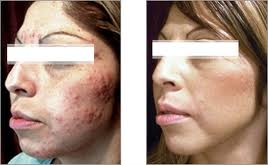 It is a machine that uses broadband light and vacuum to clear acne. It is a safe and comfortable procedure and this is important especially for those with red, painful, swollen acne lesions with or without pus. It works on ALL skin types so no matter what skin color you are, Isolaz can help. This is thus different for Chemical peeling and lasers which are more risky for those with darker skin tones. It gets rid of acne by fighting the root causes of acne. The broad band light reduces inflammation and kill the microbacteria that's causing the acne lesions to be painful, inflammed and pustular while the vacuum lifts the lesion to clear the debris stuck within the acne pore, thus providing deep pore cleansing. The heat that's generated will then stunt the sebaceous glands thus reducing oil production, inflammation and redness. Isolaz can be performed alone or together with our other acne treatments to give almost full clearance of the lesions in just 4-6 weeks! Treatments takes around 20min only. There is no downtime as the slight redness settles in about 20min to 2hrs while there is no swelling or bruising. Repeat treatments are done 1-2 weeks apart and upto 4 or 6 treamtents are required for almost full clearance. Isolaz is also great for BODy acne, which is very difficult to rid off. Clinical studies showed immediate results within 24-48hrs, with reduced redness, clearing of skin discoloration and drying/flattening of blemishes. Non Responders to oral medication, topical medications and lasers had over a 75% reduction in lesions in 2 months. 85% of patients who had Isolaz treatments experienced clearer skin. Watch our video of DrAngeline treating a patinet w Isolaz.